Well ... really quite sad when entering the fourth month in 2011 and all cinema screens Indonesia is still filled with films that have aged five years or more. The crisis experienced by the national film industry is still not showing any signs of ending, but if the importer of foreign films nationally and then switch their choice to enter the smart independent films from the United States to Indonesia in the cinema screen to fill the void pause latest release movies made in Hollywood, True film lovers should not feel too discouraged by it. Breach is one of Hollywood political thriller of 2007 a new production found its way to broadcast in Indonesian cinema screens this year. With the theme is quite heavy and the rhythm of storytelling that runs medium - if you do not wish to be called as slow - must be recognized Breach is not a film that will be enjoyed by anyone. 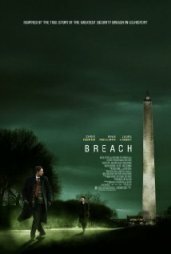 When first released in their home country, Breach managed to get a lot of praise from film critics the world, especially to the ranks of the acting cast is brilliant, the way the story is so binding as well as the direction of Billy Ray is pretty smart. But "smart" is not the only reason that makes Breach very worthy to be enjoyed. Billy Ray, along with Adam Mazer and William Rotko, write Breach storyline based on a true story about the betrayal of state security by the Federal Bureau of Investigation agent, Robert Hanssen, which lasted for nearly a decade and is often referred to as the worst intelligence disaster in the history of the world in United States. Breach opens his film by showing scenes of the justice process experienced by Hanssen (Chris Cooper) for further recounts how Hanssen could be in the position of defendant in court. The FBI has actually long suspected intelligence Hanssen as a party in the state who sell information on the Russian military, but they have not found enough evidence to arrest Hanssen. Therefore, the FBI then recruited one of its employees, Eric O'Neill (Ryan Phillippe), to spy on each daily activity with the undercover Hanssen became his assistant. Initially, O'Neill had no idea that Hanssen - a devout worship, always being a very patriotic and loves his family - is a man capable of betraying his country - and have a pretty weird sexual tendencies. But, slowly, with another FBI agent referrals, Kate Burroughs (Laura Linney), O'Neill began to find pieces of the answer to why the FBI was so eager to bring down Hanssen. Billy Ray may not have the manuscript material that could give him a chance to display the hunting scene of an agent who defected to the state through a row of action scenes full of explosions. Conversely, Breach contains many long dialogues then used Ray to explain the personality of each character in the film's storyline. Points is what makes Breach appear so different but managed to tie the attention of the audience. Slowly, Ray introduces viewers to the two main characters, making these two characters as attractive regardless of their character totally different and provides an explanation of why Robert Hanssen to betray his country is patriotic and why O'Neill would endanger his life and was involved in the FBI's secret project them. Ray build paint and mouse game between the two are not with the bang of explosions and weapons fire, but with intelligence contest between them through the role played by these two characters when they're dealing with one another. Obviously, a script that utilizes the learning process in storytelling kisahny characters will not work if you perform perfectly without the presence of the ranks of actors who brought these characters well. And Billy Ray is very lucky to get Chris Cooper and Ryan Phillippe to act as the two main characters in this film. While performing with the relatively subdued role, Cooper is able to show the character of Robert Hanssen became a character that was so influential even in silence. Carriage and a cold stare Cooper makes Hanssen became a character who is so mysterious but still be able to maintain a warm emotional relationship with his audience. Ryan Phillippe themselves may get the typical role as a man who is in disguise. But still, capable of handling the role of Phillippe as Eric O'Neill so well and appear to balance the game character given by Cooper. In addition to Cooper and Phillippe, Breach also get satisfactory support from the cast of supporters. Laura Linney, who plays an agent who was behind the recruitment of Eric O'Neill, and Caroline Dhavernas, who plays O'Neill's wife, are two actors who appear quite prominent along the two main actor of this film. Breach may not have many elements that will be able to make this movie attracted so many viewers: the film offers a thriller that is formed by a row of the character dialogue that lasted 110 minutes. However, there will be no one can deny that Billy Ray's Breach has been packed into a meal that is so delicious. Ray compile every intrigue that formed in this film so carefully and then make a game of intelligence is very attractive fights between the two main characters. At the end of the film, viewers will find themselves feeling a deep sympathy for the character of Hanssen - who throughout the film established itself as a solitary character who never appreciated by his country, although most likely still will not release the title as a villain than he is. Neatly arranged with a smart script, the game's acting is convincing and the direction of Billy Ray who then summarizes all these elements into a film that is very alluring.